Last night we held our second community meeting for We Live Here in the lovely Electika Cafe on Western Road (yes – that was a plug – it is lovely and they were kind enough to open for us in the evening – they also followed through on our project meeting promise of cake at every meeting). This was for the Brunswick site – which was originally Brunswick and Regency until we realised (though the research process) that this was two distinct areas that would probably work better as two separate project sites. Brunswick is a real mix of demographics with high density short term occupancy alongside beautiful and much loved Regency Terraces. We found a huge amount going on online and offline but we also found it was fairly disconnected with relatively few linkages between groups and projects. Learning from the first community event we held, this was never intended to be a huge meeting but instead a chance to test our ideas on residents and get permission to carry on developing them as we feel at a point where we can’t continue without active participation from the people who live in the areas we are working in. We therefore contacted participants based on people we had met through the research and the event was a bit like Brunswick in that it turned into more creative and free form drop in session than a formal meeting. We had a good turn out however with one ward councillor and 4 local activists over the course of the evening. From the WLH here team we had Anthony, Nicky, Susie and I – with me facilitating, Anthony pitching the project and Susie describing the research as she has the most in-depth knowledge of the area. As with other meetings the idea came alive for people when we showed them the prototypes sites and also when we explained that this was a tool to connect existing content rather than a new website that would need feeding and updating. The emphasis on this was on providing a good democratic process – this was a reasonable group that don’t just want to get their own way but they want to stop being bounced between officers and members and they would like more transparency about the decision making process. This is not really in relation to the big decisions – the example repeatedly cited was with a question about getting white lines painted. Reflecting after the meeting we think there is a possibility to network groups together here and create a kind of shared governance which is available to manage both cooperation and conflict. I also keep coming back to the lack of understanding of the officer role within the community – even with a group as informed as this one there is a sense of not understanding where responsibiloty sites between officer/member and there was also a frustration that including a councillor seems to stimulate activity even when it appears to be an officer job to sort. We know that this is not what officers intend and also that the boundaries between them and the members feel unclear to them as well. My other observation is that all three parts of this triangle officer/member/citizen just don’t understand enough about the other’s perspective or context and don’t take what seems to be an obvious step of just treating people like people and asking. This is a poorly formed observation at the moment but one I will mull over more – but it is part of where we want to reach to with We Live Here. I think the answer lies in the idea of being open by default – more on that here. Back to the meeting – most of the people who attended would like to continue to work with us and we have had offers to take the project to others in the community to widen the group. We have agreed to try and attend a couple more local events to widen the message about the work with a few to having a more formal planning / development / ideas meeting in June. This is really the first step in properly passing ownership of the project to the community and we feel we have permission from a few key people to continue to develop the idea in the community. It would be so much faster just to dive into a build phase on this but it would be wrong – this has to be co-produced and not designed from the outside and so finding active participants who see the value of it is a vital step. There is loads more to do but we have a strong start I think. This post describes the state of play with respect to the social network analysis process we have been using for We Live Here. In short – we have a method but we need to be better at using it. A complete social network analysis of a neighbourhood or community would be a time consuming and expensive piece of work. If your intent is to use the discovered networks as the basis for community engagement activities then argueably an extensive exercise is not good value for money becuase of the dynamic nature of networks and the need to re-investgigate the network to discover the changes. With We Live Here our objective has been to sample the network only to the extent which is necessary to create enough linkages to make it possible to create a dynamic entity which can then go on to self-manage further discovery and growth. Essentially we are looking for a catalyst group which will then work to find and connect the wider network within the community. The sampling therefore needs to be robust enough to give confidece that we have found useful people but lightweight enough to be affordable to implement across large areas. 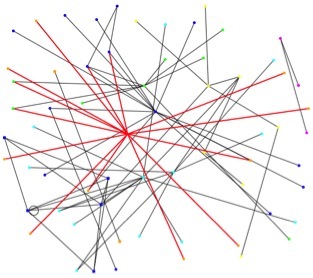 In Social Network Analysis terms this is broadly speaking a ‘snowball’ approach which explores the network from multiple points of entry rather than doing a complete sampling from specific individuals – in essence we are trying to understand reach rather than depth of social ties. This echoes the practical sense in which we are using the SNA in order to support communication primarily rather than creating social cohesion which we see following on as a positive byproduct of improved communicative ties. We are also trying to find community actors who are not currently participating in ways which are already known to the public sector as well as creating an overview of public sector activities in the area or topic we are examining. This search for new kinds of participants could start in of variety of places. We focus on an online search which yields the kind of partcipants who have the skills that we need for We Live Here and also highlights new kinds of informal civic participation. With this kind of approach the most important element is finding the right point of entry into the network. If we do not discover this at point (3) then further research is needed before we start the community SNA process. Different techniques can be employed to find these points of entry and part of the agility of this approach is to ensure that you do not commit time to the process before you feel confident that you have identified these points. The initial research as part of the pilot process tool at least 10 days per site. We expect to halve this for the second iteration and our ambition is to acheive 3 days research for the final process. Our biggest mistake is in not remembering that this is a rapid sampling method rather than a complete analysis. Our objective is highly tactical and we need to keep at the from of our minds the fact that we are just looking for the point of entry and critical mass rather than a full picture which would be unattainable on the resources we are putting to this. For the next iterations we need to be better at limiting the time we spend on dead ends in network terms and keep coming back to find a new way in. We (and this is really me) also need to be more disciplined about regular research reviews. Its very tempting to leave this to look after itself but the data needs to be looked at systematically on a regular basis to avoid falling down a rabbit hole. Where does it go right? Overall we are pleased with the method and are looking forward to trying it out from scratch with the next sites (more on that soon). Its proving robust and also effective at helping to change the dynamic of community conversations. In terms of formalising it I plan at some point to draw out and document some of the methods we have used to find the starting point as well as tightening up the write up of the discovery process used once we have the point of entry. We are currently working on the plan for the next 12 months. We have commitments from the Council of course but we’re delighted that the NHS is also going to be formally involved in the next stage. We increasingly think that there is huge strengths in this kind of model being open to different public bodies and we are looking forward to exploring the practicalities of what this might mean. I also need to write up our first community meetings – will do that this week – promise. This is another action research note on We Live Here – the Brighton and Hove Creative Councils project. You can read previous posts here. The last few weeks have been spent in parallel project planning and also starting the community mapping exercise. We had a really good team meeting last week where we cleared a lot of ground which was great. Our next milestone will be a first workshop with external stakeholders – really interested parties from the City and then the launch of the project website. One of the strengths of having a project consortium from a number of different organisations is that we are able to reflect very different views and because we have a lot of mutual respect turn these into constructive positive conversations. I also increasingly believe that you do need some external sand to make a pearl in the organisational oyster and that a Council led project would be more more risk averse. Hopefully with our close partnership we are going to be able to balance disruption and risk in a good way. Yes – we do seem to like the word ‘governance’. This is a slightly more granular breakdown than we had originally but it makes much more sense. We’ve divided it up partly to eat the elephant but partly in order to keep use the whole project team to lead different strands of the work so that we keep a fresh perspective when we bring stuff back to gether in our two-weekly meetings. We have made progress across all the strands and we hope to get the website up and running before we have our first project workshop with our wider stakeholders (not the communities we are working with) on the 16th December. More on that when we manage it. This post is concerned with the community mapping which we (public-i) are running. We want to understand the ‘network of networks’ in the area, identify the key people who connect these networks and also to work out where we don’t have connectivity. We will be looking at online and offline activity. Once we have this then we are going to be putting it together into a community directory website that shows everything we have found (subject to permissions – see below) – it should hold a mirror up to the community. We will then be holding an open spaces style meeting with the community to present some ideas as to what they could do with this – more on that in another post. The methodology for this is built on the social media audit work but uses an additional Social network analysis questionnaire. We are taking a ‘snowball’ approach by starting with the project team and working outwards from there. In parallel we will conduct a physical walk around and online search which we expect to uncover some activity which is outside of the current engagement process – but we shall have to see. The civic space prototype will be in the form of a community directory and will be built using Citizenscape – this is probably the nearest example we have in the meantime. Our intention is to turn this mapping process into a self-reporting tool – we are trying to work out what the least possible intial information is to then be able to turn the process over to the community to map itself. This is going to be essential if this approach is not going to be incredibly expensive – as has been the problem with other social network analysis community projects. We’ll be working on this viral mapping in the new year once we have completed the bulk of the this iteration. Yes – we are using the word iteration in two senses – one to refer to the overarching project iteration and the other is within the mapping process. I am now talking about the mapping iterations. We have, at time of writing, done the intial interviews witht the project team which has generated around 40 contacts across the 3 pilot sites. Its clear from the data we gathered that one of the sites has been the subject of a lot of prior engagement activity where the others have had less contact with BHCC in this way. Its going to be interesting to look at how this effects the implementation of the project across the different sites. We are now filling in some of the blanks in that data (mainly where people knew organosations but not individuals to talk to) and also carrying out the online search. We will then have a short list of people within the pilot site communities to start talking for the next iteration of the mapping. I am hoping/assuming that the online search will throw up some activity that we don’t already know about. When do we talk to real people? This first iteration is very much within the project team but the next step is to speak to the communities that we will be working with. I say will be working with – the first step is really to find one person in the community who is reasonably active and connected (and should be highlighted by the first iteration) and then asking them to act as a community host – to introduce us to some people and go on a physical walkaround and point out civic spaces and important places. Where BHCC has already been active this person should be fairly obvious which is both a good and a bad thing. Good in that we would be piggy backing on what is already a good relationship but bad in that realtionship already has embeded ways of working and outstanding promisies and commitments on both sides that we will of necessity be disrupting. Disruption is a good thing when you are trying to innovate but alarming for the disrupted. We are realising the strength of the project being supported by but not run by the Council in that we are able to be more disruptive that we would be from within the organisation but it is still have to be extremely careful to keep this as a positive activity. We have also been extremely cautious (too cautious?) about taking the concept out to the public – hence our lack of a outward facing website for example – because we are still concerned that we haven’t got a simple and accessible way of describing what we are doing. Happily Jo Ivens has been making real progress with this and we think we are nearly there. Clearly this blog is no place for a simple and accessible description so I will leave the big reveal for the website launch. There are a lot of sensitivies around actually taking this research into the field becuase we risk damaging important relationships – however we are have safeguards in place on this which I describe in the next section. When talking about these concerns though we see a real range of feelings in the project team – which is probably helpful. Speaking personally I find it fairly difficult to distinguish when we are ‘going council’ and being very risk averse and when we have legitimate concerns. I hope this will start to become clearer once we are out and the field and talking to ‘real’ people. However we need to crack on with this – the longer we wait to get people involved the more difficult it is to really co-produce the solution – we need to be a bit quicker and a bit bolder. We are conducting research as part of the We Live Here Project. You can read more about the project here. This first stage of the project involves finding out what networks, groups and active individuals are within your community and then we will be creating a directory for general use. This directory will include organisations and websites but will not have names of people unless they personally agree to be included in this way. This is now with the project team for discussion but please comment if you have any thoughts on this. This research disclaimer is going to be used with our ‘statement of intent’. We intend our work with the communities to be co-productive – we don’t want to dictate the shape of their civic spaces becuase we think its the wrong approach – and just wrong. it would be disingenuous howeber not to be clear about what our aspiration is however. The question of governance of the civic space – and its curation – are big meaty issues that we are working on at the moment so we can have some draft proposals for the open meetings early next year. One of the other things we have added in before the second iteration is a very explicit ‘what can we do for you’ question. Once we start talking to our pilot sites we want to be gathering information about what they want and need from the start so that we can be confident of offering some positive by products for the project as planned. We are also starting to form a much clearer idea of what the benefits of these spaces could be beyond the wider democratic purpose which is so abstract. In short we think we will offer greater resilience within communities as a result of strengthening networks at the same time as providing an open space for people to tell their stories in a place where they will be listened to. Next step will be to create some metrics that will help us judge how well we are doing against the many objectives and ambitions I have listed here. Expect another post after our workshop in a couple of weeks – and expect everything to change as no plan survives contact with the outside world!